This is a terrific offer for start-ups or small businesses! 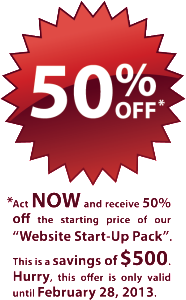 At Troy Kendall Designs we are offering 50% off of our “Website Start-Up Pack.” This is a $500 value! Hurry…offer ends Feb. 28, 2013. Contact us TODAY to receive a quote for your website!